I am delighted to once again join all you friends from the British business community. I want to thank you most warmly for hosting such a grand dinner. This is a very meaningful way to mark forty years of full diplomatic relations between China and UK. 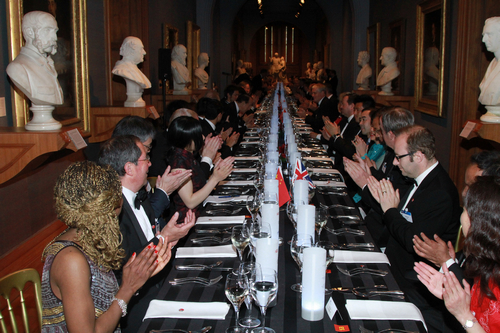 In this special year for China-UK relations, it is appropriate to refresh old friendships and make new ones. More importantly, it is the time to learn from the past and so create a stronger future. It is the time to build on the progress made and work for greater achievements. 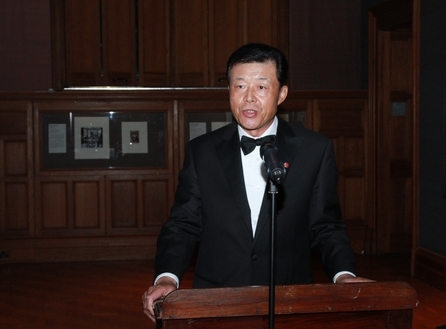 · Mr. Li Changchun, member of the Standing Committee of the Political Bureau of the Communist Party of China and State Councilor Madame Liu Yandong successfully visited the UK last month. Many of you present here attended the relevant events. 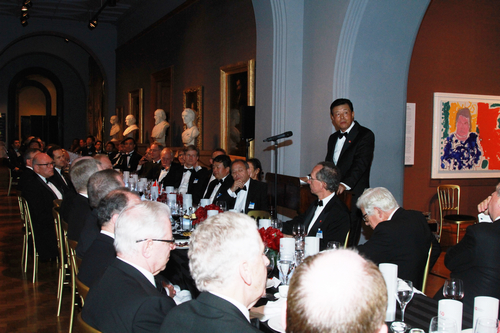 · The China-UK high level people-to-people dialogue was launched. · The UK Now project was unveiled in China. · We were preparing for a series of important dialogues and visits scheduled for later this year. · We were planning for multiple cooperation and exchanges in trade, investment, finance, cultural and people-to-people links. · We look forward to the London Olympic Games becoming another highlight in our bilateral relations. These are all positive trends. However, there are always some forces working against our joined efforts to build warm relations. · These forces dislike the dynamic growth of China-UK relations. · They have trifled away the progress made through hard efforts. · They have wasted the rare opportunities in our bilateral ties. · This is why we now face an undesirable situation in our relations. This is not the first time we have encountered difficulties. History shows a variable climate in the past four decades. We have experienced both storms and calm sunshine. Our relationship has never been plain sailing. We have often had to travel on a bumpy road. Some of you may recall two months ago a reception at the Chinese Embassy. At that time I mainly talked about achievements in these past 40 years. This evening I will focus on the lessons we should draw from those four decades. Learning lessons from the past will help us avoid roller-coasters in our relations. This approach could remove many bumps from the road we will travel along. To drive home my message, I will quote a famous British statesman. "Nations have no permanent friends or allies, they only have permanent interests." · What are the interests involved in China-UK relations? · How should we properly handle these interests? To address these questions, I believe the following three points are essential. First, we should advance common interests. We have success stories in this aspect. In the 1970s, opposing world hegemony, and power expansion, served the common interests of China and UK. To advance these interests, our two countries overcame difficulties and established ambassadorial relations. In the 1980s, maintaining stability and prosperity in Hong Kong represented our common interests. Through negotiations, we signed the Joint Declaration over Hong Kong. This milestone document laid a solid foundation for the final solution for the future of Hong Kong. Lord Howe was one of those who made important contributions to this historical achievement. Today, common interests of China and UK cover broader areas. · Boosting growth of both economies. · And strengthening people-to-people links. · And jointly tackling common challenges facing all mankind. China-UK relations can only keep growing when both nations are truly committed to a Sino-UK comprehensive strategic partnership and common interests of the two countries. It should be no surprise that we have different national interests. · Preserving its basic state system. · Defending its national security. · And ensuring sustained and stable economic and social development. These interests are the 'red line' of China's foreign policy. They shall not be crossed by any foreign country. Any attempt to support and connive at anti-China separatist forces hurts China's core interests. Whatever the excuses, such moves will meet firm opposition from China. China will not do anything to undermine Britain's national interests. So it is perfectly reasonable that Britain should also respect China's national interests. If that is not the case then bilateral ties will surely suffer. My third point is that we should uphold overarching interests. National interests are overarching because they concern the people of entire country. So, what are in the best interests of Chinese and British people? I believe that our two peoples are eager to see greater progress in China-UK relations and more fruitful cooperation between us in all fields. This certainly is the goal of all you business leaders gathered here this evening. Through cooperation, we will be able to expand trade, increase investment, create jobs, and promote economic growth. These will bring benefits to all of our peoples. 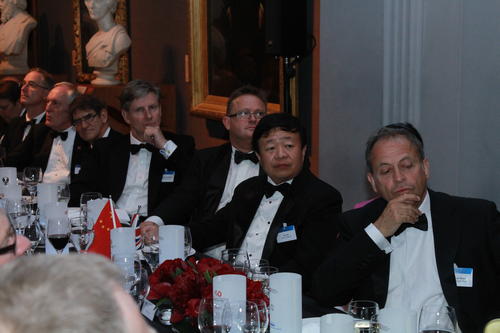 Working towards these achievements make up the overarching interests of China and UK. Political leaders should at all time uphold the overarching interests of the two countries. They should always support the larger interests of bilateral relations. They should follow the will of the people and advance well-being of all the people. What political leaders should not do is to pander to minority views. They should not please small groups at the sacrifice of overall interests of the country. This is what distinguishes statesmen from politicians. In China-UK relations, we need statesmen who have strategic vision and keep in mind the larger picture. We do not need short-sighed politicians who are blinded by immediate interests and obsession with votes. What we need to serve is overarching national interests, not interests of interest groups, not interests of some forces. · Carry forward the spirit of 'icebreakers'. · Leverage your influence and play your part in creating a favorable political environment for economic cooperation. · And help bring China-UK relations back to a normal track. This is my expectation of you! It is also our shared interest!